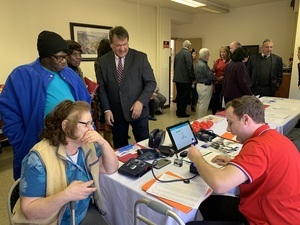 Surrounded by senior citizens at the Brooksville Terrace Apartments in Port Chester, Westchester County Executive George Latimer and Commissioner of the Department of Senior Programs and Services (DSPS) Mae Carpenter received a $7500 grant from Greenwich Hospital for the Telehealth Intervention Programs for Seniors (TIPS) Program. The TIPS Program, an initiative overseen by DSPS, provides twice-weekly checks of vital signs for senior citizens by a trained technician. 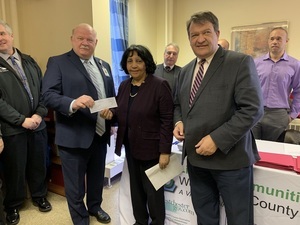 Greenwich Hospital President and CEO Norman G. Roth presented a check to Westchester County, symbolizing another year of funding for the Program. 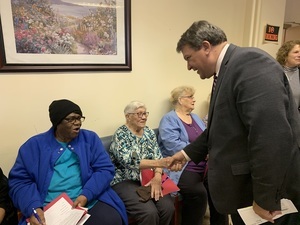 Each year Greenwich Hospital sponsors, develops and participates in a wide variety of community-based programs and services, as part of his mission to promote health and wellness. TIPSparticipants have their vital signs checked weekly by a trained technician. The data is transmitted to a nurse who reviews it remotely. If there is cause for concern, the nurse may contact the patient, caregiver or primary care physician directly. Participants leave each session with a “TIPS Sheet” that includes their vital signs, an explanation of results and relevant recommendations or referrals. This information helps seniors to manage their own health, and be proactive if they notice any changes. For more information about the TIPS Program, read the brochure or contact DSPS at (914) 813-6408.